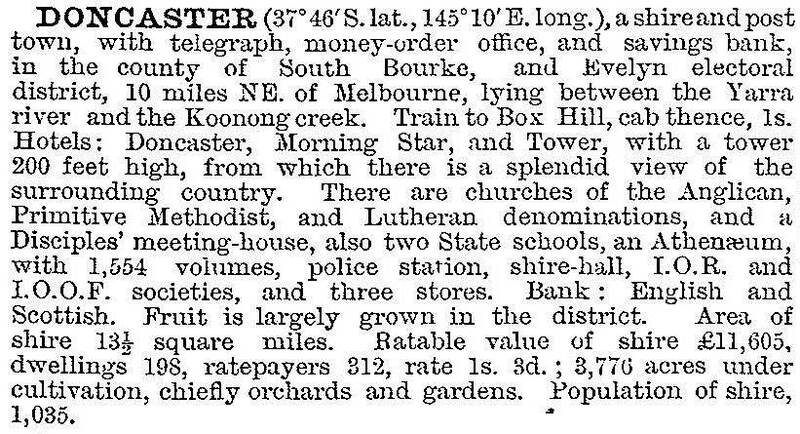 Doncaster, formerly an orchard area and now residential suburb is 11.5 km north-east of central Melbourne. Settlement a little to the west of Doncaster began with Unwin's Special Survey in Bulleen in 1841. The Special Survey of 5120 acres was bounded by the Yarra River (west and north), Foote Street (north), Church Street (east) and the Koonung Creek (south). Further settlement occurred along the Koonung Creek and other streams in the Doncaster area in the 1850s. Several of them were German, and a Lutheran church was the first one in Doncaster in 1858. A Lutheran school opened in 1860 and a denominational school in 1861. The German community was named Waldau, but the name Doncaster gradually became commonly accepted. In 1854 John Robert Wilson, from Doncaster in Yorkshire, England, built the Doncaster Arms Inn on the track through the stringybark forest to the Warrandyte gold diggings. The track was later named Doncaster Road. An alternative derivation may be from William Burnley, a Richmond land developer, who sold land in Doncaster in the 1850s. He also was from Doncaster, England. The expansion of metropolitan train services bypassed Doncaster. Attempts were made to get train services, but unsuccessfully. A homemade tourist attraction was the building of a lookout tower in 1877 on a hill beside Doncaster Road. It attracted visitors from the International Exhibition in Melbourne in 1888. The exhibition also featured an electric tram, which became a prototype for a service from Box Hill to Doncaster in 1889. The service lasted until 1896, and tram trips to the lookout tower were a popular recreation. In 1915 Doncaster and the former Bulleen Shires were united as Doncaster and Templestowe Shire. Fruit growing remained prosperous until the Depression and the rural landscape was only a little altered by suburban growth until postwar years. Between 1950 and 1955 the shire's population grew at an annual average of 5%, and in the next five years the annual average growth was 28%. In 1963 G.J. Coles and Co acquired a 9 acre site at Whites Corner, at the intersection of Doncaster and Williamsons Road. The corner then had a landmark two storey general store, but it was an ideal green-fields drive-in shopping centre site where the only transport could be bus or private car. Later in the decade Westfield built Doncaster Shoppingtown at Whites Corner, and by the 1990s its lettable floor area was 90,000 sq metres. A little eastwards is the site of the old lookout tower, the old shire offices and the modern civic centre. When the lookout tower was constructed in Doncaster it took advantage of an already elevated location with 360 degree views. Williamsons Road, running north from Shoppingtown, runs along a ridge line. In about 1974 the Shoppingtown Hotel was built, taking advantage of the view to the west. Soon afterwards an apartments tower followed. By the 2000s there were several such towers. In 2002 Manningham Council adopted a plan for Doncaster Hill, an area of 54 hectares around Shoppingtown, which foresaw 4000 residential apartments being built there. By 2012 five towers, varying from five to twelve storeys, were constructed. Doncaster and Doncaster East's suburban girth is about 6 km from Bulleen to Donvale. Running through the area is Doncaster Road, a carrier of heavy traffic volumes to and from central Melbourne. The prospect of fixed rail transport was put aside in expectation that extension of the Eastern Freeway would relieve the traffic. The freeway was extended from Bulleen Road to Doncaster Road in 1982 and to Springvale Road in 1997. Doncaster has two State primary schools, a secondary college (1969) and a Catholic primary school (1969). The Doncaster Municipal Gardens are a large open space on Ruffey Creek. In the west of Doncaster is the Eastern Golf Club which dates from the 1920s. On a modern note, at High Street and Winter Way there is the heritage listed Winter Park cluster housing (1970). The Waldau village had been built around Ruffey Creek. Before World War I the names of King, Victoria and George Streets had been Wilhelm, Bismarck and Waldau. Opposite the municipal gardens there is Rieschieck's Reserve and Schramm's cottage (East Doncaster). South of the gardens there is Friedensruh cottage (1853) in Waldau Court and Trinity Lutheran church (1892).